What can you say about Pete Frame? 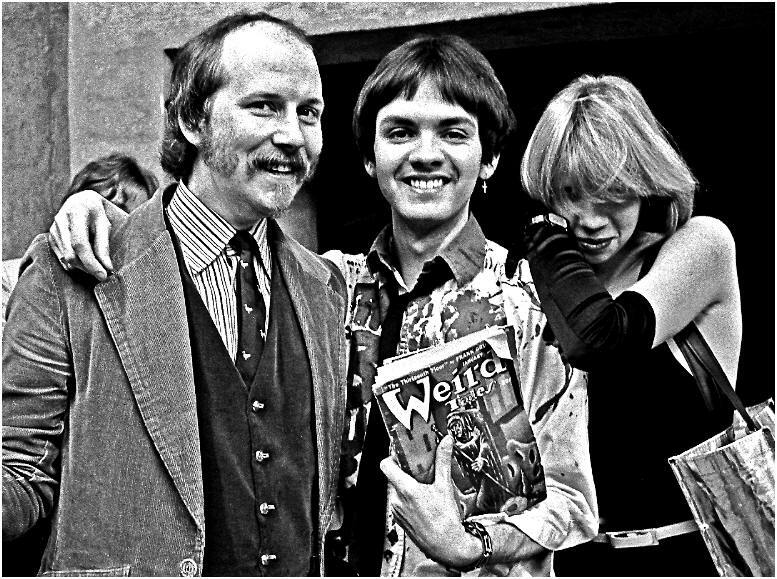 Journalistic legend with Zig Zag, band manager, original early Friars member and of course well famous for his Rock Family Trees where no band seems too difficult to research and map out their history, although Man are on record as saying their history "would give Pete Frame nightmares!" On the day of the 40th anniversary gig, Pete said a few words to the website.....some of which we can legally print! Hi Pete, welcome to the Friars Aylesbury website! As someone who has always done fastidious work himself, I can well appreciate the ingenuity and the detail and time and effort that's gone into it...I think it's great. It's taken a long time! And here we are at the Civic Centre where my I met my wife in early 1976. She was a student at the college - and she and her friends used to come here to the coffee bar at lunchtimes. She knew the guys in the local bands and she used to go to Friars. She's on that big Geoff Tyrell photograph (from the Aylesbury Rock Explosion Friars gig in September 1976). I knew her back then, but we didn’t get together for another twelve years. NOTE - Pete has this picture with him and we readily identify David Stopps, Pete, John Braley, Magenta De Vine, Robin Boult, Pete Trewavas and many more! There are loads of my old mates coming tonight. Whilst your career predates Friars, those first gigs at the Friarage Hall, what are your memories of that period? I think David phoned me up just after Friars had just started. I was living in Luton but had been coming over to Aylesbury for several years, to the Grosvenor (the Borough Assembly Hall) to see people like Rod Stewart and Jimi Hendrix and Georgie Fame and Manfred Mann. David told me he was putting on bands like Jody Grind and Edgar Broughton, and that was inducement for me to start coming over again. I was writing full time by then – Zigzag started in April 1969, a few weeks before Friars. I got a very positive and powerful vibe immediately, and it grew stronger every week – to the extent that I soon felt completely at home there, among friends. I met not only David but people like Robin Pike and Adrian Roach and Terry Harms and Carole Watts . . . and I thought “why am I living in a stagnant town like Luton when I could be living here?” So I found a cottage in North Marston and moved there in April 1970. Best thing I ever did. Stayed there for the rest of the century. The Friarage Hall was small and the music filled the room, got the curtains swaying. Most of the bands were known in underground circles but were still young and hungry, all hoping to get a good grip on the ladder. Best time to see a band – before commercial elements distract them. Of course, to survive and prosper, to prolong active life, you have to expand your audience and play increasingly bigger venues – but how cool it was to get up close to bands like King Crimson and Black Sabbath and Mott the Hoople. It was quite fabulous while it lasted. When David took off for the south of France (in summer 70), to see his sister I think, he entrusted me to look after the club, make sure the bands got set up okay, make sure the place got locked up when everyone had gone home, all that sort of thing. When Argent played what turned out to be the last gig, the place was packed solid. Word had got round that Friars was closing immediately as a result of establishment pressure. In those days, there was widespread anxiety and animosity between the police and anyone who didn’t have a regulation short-back-and-sides haircut. Is that why the club closed? Apparently, the subject of long hair and drugs had been discussed at the police station – but I can assure you that the use of drugs was minimal. Some of the audience might have had a toke or two before they came, and others might have disappeared into the night at the interval, but drugs were never in evidence on the premises. It was probably a little different backstage, but discretion was always the watchword. I don’t think there was any justifiable reason for shutting the club down . . . it was simply tabloid-generated neurosis, very much of its time. Anyway, the sun-tanned David returned from France to find that he’d been evicted. It was fate, of course. He had just about outgrown the venue and it was time to move on. Yes, Friars moved on to the Grosvenor which was a tacky dance hall but had its own charm and a quirky history. You could sometimes sense the ghostly presence of Johnny Kidd, who played there about a billion times at the turn of the sixties. The hall was spacious enough but the bar was always shoulder to shoulder like a sardine tin. I saw dozens of memorable gigs there – Roxy Music, Spirit, Stoneground, Lou Reed, Fleetwood Mac, the night Peter Gabriel jumped out of a birthday cake, that David Bowie gig where a coach load of hot-shot American journalists turned up. He’d chosen Friars as the best atmosphere for his showcase performance. Years later, I interviewed Bowie. I’d never met him face-to-face before but as soon as I told him I used to see him at Friars, he treated me like an old mate and we talked for hours. By the time Friars moved to the Civic Centre, its respectability was never in question: the club had become one of the town’s greatest assets. And – I can tell you this because I checked it out – it was the best place in Britain to see the latest up-and-coming bands. Never any trouble. The fact that the bouncers were 16-year-old schoolgirls gives some indication of the atmosphere, which was always vibey and uplifting. A lot of energy and warmth and communality. I consider myself very lucky to have been part of it all. Paradise. I met so many good friends there during this period. In fact, on Friars nights, every pub in the middle of town was teeming with people I knew. Aylesbury was so great in those days – full of writers and weirdos and photographers and musicians, flamboyant characters like Magenta and Otway and Fish and Needsy, and the most beautiful women on the planet. Some of whom are here tonight, I’m glad to say. Exactly. One of the things about this 40th anniversary gig is that there will be a lot of people in the bar reminiscing and catching up, there'll be people you haven't seen for a while! Undoubtedly! I've got friends coming down from London and up from Cornwall for this gig, people who have never been to Friars before but know of its reputation and want to get a whiff of its ambience. They're going to be doing that tonight! Back then, we would sing along and although Edgar didn't manage to exorcise all the demons in the town, he instilled in the audience the idea that you could either be a good citizen of the world or you could be an exploitative, self-serving wanker. For me, that song was a symbolic moment in the evolution of Friars. I’m delighted to say that everyone I’ve met here tonight has been in the former category. The Ramones and Blondie were amazing, so were Commander Cody and Dr Feelgood, Captain Beefheart, Iggy Pop . . . every week was a revelation in some way. You have to hand it to David, he was so on the ball. Thank God we had him in the town – because a venue is only as good as its promoter, and he was the best. You find me another club in the world where the promoter writes such an idiosyncratic newsletter every week, where the entire audience feels a spiritual connection. He was slightly bonkers, of course, but that’s why we liked him so much. A perfect candidate for the Queen’s honours list, if you ask me, better still the House of Lords. Bands loved him and they loved playing Friars. But could I also mention Robin Pike, the spiritual father of Friars? He taught at the Grammar School and during that late sixties/early seventies period was one of the coolest teachers in the kingdom, and one of the most influential. I know the CEOs of Sony and Island Records – ex Grammar pupils – and they both single out Robin as having cranked them up to the point where they could climb whatever mountain was in the way. He had that effect on literally hundreds of his students. I’ll tell you what would be good – a statue of David and Robin sitting on a bench in the Market Square. You are world renowned for your Rock Family Trees - how did this come about? I was writing about rock music and when I went to interview musicians, I would take handwritten notes with arrows drawn on them, so I could trace their history when I was talking to them, and these somehow developed into family trees. I had studied architectural drawing when I was training to be a surveyor, before I became a hippie drop-out, and I just got back on the drawing board and started scribbling. 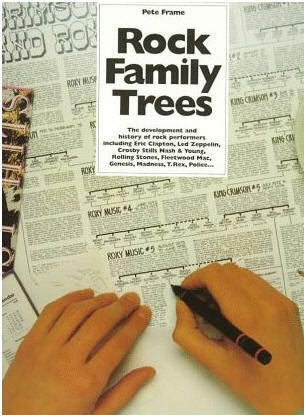 Before long, my family trees were in music papers, in tour programmes, on album sleeves, on television. It kept me going. Turned me into a gibbering lunatic, but I somehow managed to make it through. I mentioned the Rock Family Trees because they are an institution to any self respecting rock fan. Nice of you to say so. One of the television programmes was on again last night (on BBC4) and hopefully they'll get round to doing another series one of these days. The trees are going to be on the internet soon: I've just gone into partnership with a company called the Family of Rock. I had planned to retire, to sit in the garden reading all the books I’ve accumulated and watching the movement of the clouds, but I’ve suddenly become embroiled in all this newfangled technology. People don’t use pen and ink anymore, it seems. It should be a very successful venture. I understand that you live in the Scottish Highlands now. Do you miss Aylesbury at all? Sometimes. But you can’t go back – except for special occasions like this, of course. I knew tonight’s gig was going to be a mind-blower . . . it was an 1100 mile round trip for me, but there was no way I could have missed it. I have to say that I do detect signs of fatigue in the town, but as long as Stoppsy and Kris Needs and John Braley and Robin Pike are still living here, the situation can never be entirely desperate. Pete, thanks for your time! I bet all this waffle will be as boring as arseholes! No it won't...you're a star! I am! This is undoubtedly true!